Facebook introduced a new tool Thursday that allows you to organize your newsfeed into a personalized newspaper. The feature, which will be rolled out to users in the coming weeks, lets you create and subscribe to topical feeds such as “Recipes” or “Fashion.” Under a list for “Sports,” for instance, you could add the public Facebook pages of all of your favorite teams, athletes, publications and pundits. It functions much like Twitter lists, which allows you to create and follow lists of users who tweet about the same topics, and Google Reader, which lets you subscribe to folders containing different sources about a single subject. 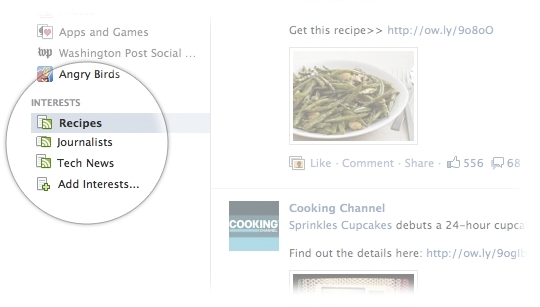 Your lists will appear on the left-hand side of your newsfeed. Top stories from each interest will occasionally appear in your primary newsfeed. 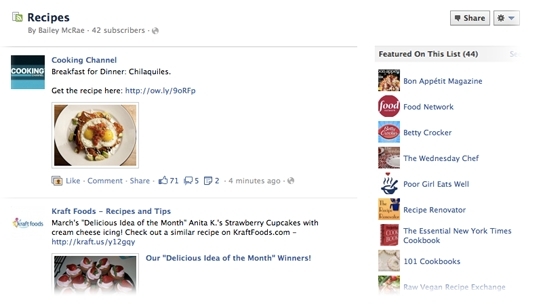 Interest lists made a brief apperance when Facebook introduced Timeline for brand pages last week. Facebook declined to furnish any details about the feature before Thursday.